Garden voles, as they're commonly known as, like to habitat the outdoors and in particular grassy or dirt meadows. Typically, voles stay in a pact style eco system with several different tunnels and passageways all connecting to each other. It is rare to find voles in or around properties unless it’s in a grassy area. These rodents love to invade homeowners back and side yards all the time. Call us right now (510) 900-8593. If you love your garden or backyard setup be wary of gophers destroying the overall landscape, but be careful with voles as well. Vole destruction is often times a big problem in agricultural plants and trees in yards. Maybe you're afraid of a vole infestation? Do you constantly see a dark brown or black, fuzzy mouse look a like running around in your yard? 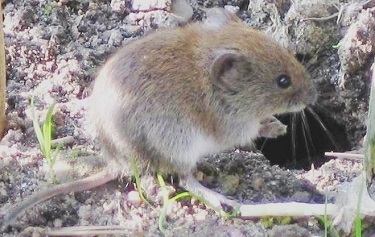 Voles characteristics are very similar to mice in overall size. Vole size and length doesn’t exceed eight inches. The best way to tell the difference between a vole and a mouse is the length of the rodent’s tail. Mice have a long tail, normally larger than half their size. Voles tail length is smaller than half their body size. Overall, mice color also appears to be lighter in tone than voles. Many of the same animals you see in wildlife such as; hawks, owls, foxes, snakes, and cats all prey upon voles. Voles pose an easy target for some of the other wildlife animals. Vole stealth and quickness is their best attribute, the ability to quickly evade any vole threat is their best strength. Call Pest Control Berkeley for vole control (510) 900-8593. Vole reproduction is similar to gopher reproduction cycles. Female voles can give birth at any time of the year, but typically the best time is during the spring and summer when the weather is best. Similar to gophers, voles produce anywhere from one to five babies in a cycle. The female vole is able to reproduce at around the age of one year and a half. 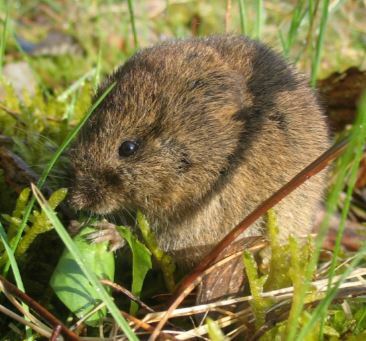 The vole life cycle is short, often times, never exceeding over two years. If there is a sign of one vole, then there are several others around. Vole families can be rather large, the problem is humans often only see the males running around and never see the females or vole babies because they're resting in some burrow. Vole infestations on homeowners land is the biggest problem when dealing with these destructive animals. The help of a professional vole expert will help in surveying the landscape of your land so if there any noticeable burrows or vole dens they can be destroyed immediately. A big vole infestation indicator is the actively running paths they create to connect with each other. Every vole situation is different. The importance of having a professional pest control management company come out to your property to check the landscape shouldn’t be underestimated. Having the best vole extermination method is vital to the overall health of your property and vegetation. A successful extermination process to consider for your place is the use of vole traps. Just like any other trap for getting rid of rodents, proper strategic placement of the vole trap is vital for the success of eliminating a threat. Many homeowners mistake themselves into thinking that it’s all about the vole trap, when location is by far the most important. If you own pests, setting vole traps up may not be the best idea. Rather than using a trap, many people resort to using vole poison or vole repellents. Trapping is a lot more complex than just simply setting everything up and waiting for a vole to come by.